This post will help explain what the difference between internal EIGRP and external EIGRP is. We have three different EIGRP autonomous systems (AS). From R1 we want to get to the IP 1.1.1.1, which is a loopback interface on R3. We can go through AS 100, which has a number of routers in it. Or we can see how we can get to it through AS 300 and AS 200. With this basic setup, what is R1's view of the world? We can see all of the prefixes in AS 100, but none in AS 200. We will not see the AS 300 link, as this will show as a connected route. Let's add the loopback to both of R3's EIGRP AS configurations, and see which R1 prefers. Without redistribution, as above, two EIGRP AS's are completely separated. So we need to redistribute from one AS to another (A to B), and to make sure that the traffic can get back again, from B to A. Nevertheless, we still prefer the route to 1.1.1.1 through R6. It does, but it still prefers the internal EIGRP route, even though the router through R2 is better, with a shorter hop count of 2 instead of 4, and it also has a better delay, which is used in calculating the best route. 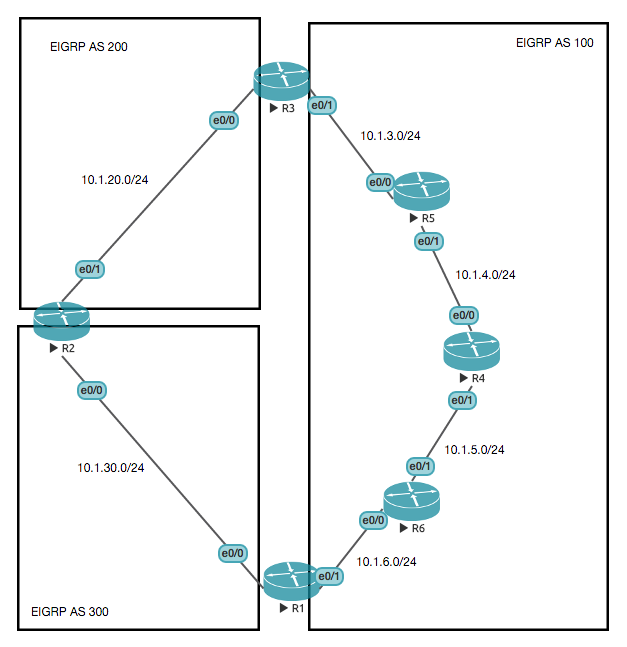 EIGRP will always prefer internal routes to external routes. Internal EIGRP routes have a metric of 90, and external ones have a metric of 170. A lower metric will always be preferred. External EIGFRP routes are ones that come from redistribution, either between different EIGRP AS's, or via a different protocol. Which we will look at now, by switching EIGRP AS 200, to OSPF. Now if we look at R1 again, we can see that we still know about the 10.1.20.0/24 network; it still appears as an external route, and we still prefer the internal EIGRP route to 1.1.1.1. This time though, we know that the route has originated through OSPF, and into EIGRP AS 300. In a nutshell, the difference between internal EIGRP and external EIGRP is that external routes come to us through redistribution, either between different EIGRP AS's, or through a different protocol, such as OSPF. 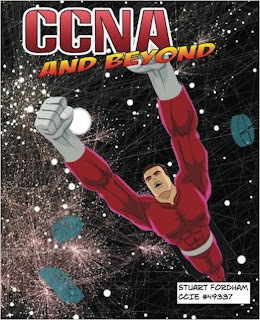 To read more about EIGRP, grab a copy of CCNA and Beyond!